21 year old Siraj Shawa takes 'Joey' a half arabian/thorough bred mix for exercise at the beach in the Gaza Strip. 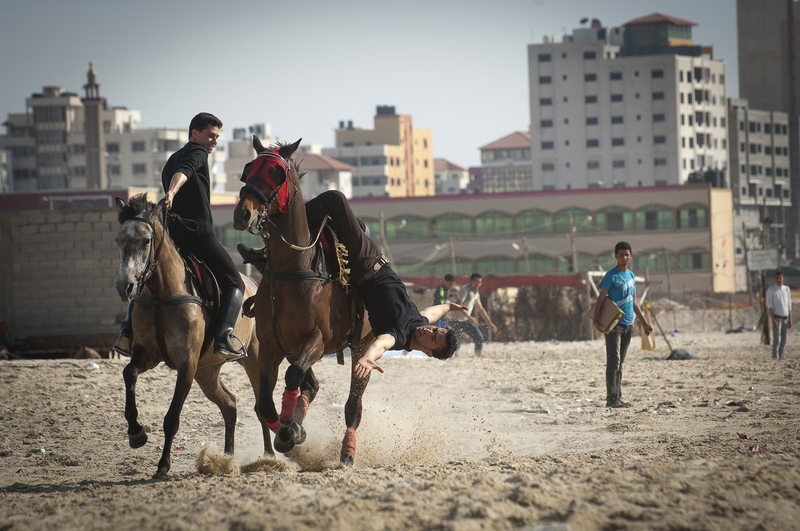 The Horsemen of Gaza. 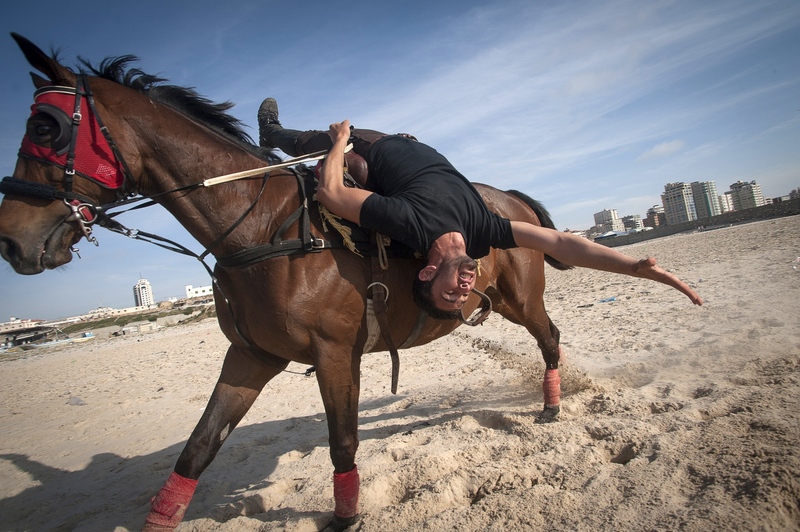 Abdulla practices his tricks on the beach front in the Gaza Strip, occupied Palestinian territory. Siraj Shawa with 'Joey', Gaza Strip. 21 year old Abdulla al Ghefari and Siraj practice new tricks on the beach in Gaza, Gaza Strip, occupied Palestinian territory. 21 year old Siraj Shawa with 'Joey' a half arabian/thorough bred mix at his stables in the Gaza Strip. 'Joey' an Arabian half thorough bred mix back at stables in the Gaza Strip. Abdulla al Ghefari waits near Ansar Square in Gaza City, Gaza Strip. 'The Horse is an honest beast' says 27 year old Abood Rahma Ghefray. He is the Gaza Strip's only blacksmith. Trained by his father since the age of 14 and furthered his equestrian education at the 'British University' in Jordan. 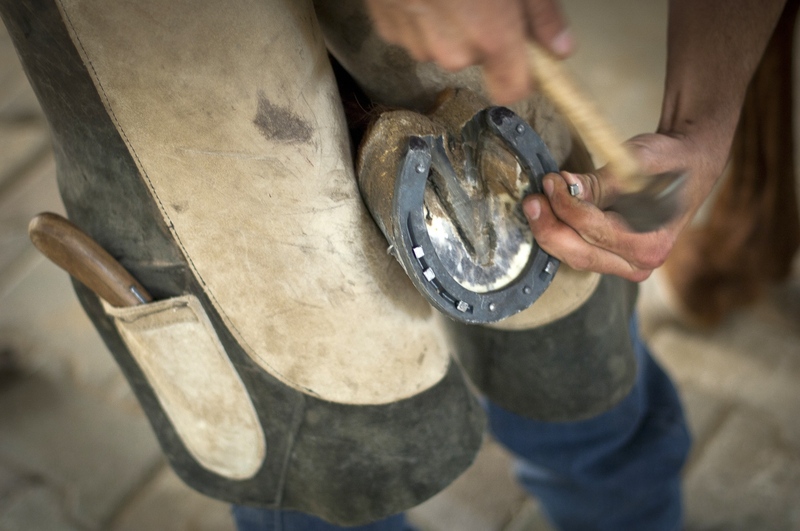 He re-shoes approximately 40 horses per month. Abood is also a keen horse racer himself. Malak a female Arabian horse at her stables in the Gaza Strip. 27 year old Abood Rahma Ghefray is the Gaza Strip's only blacksmith. He re-shoes approximately 40 horses per month. Abood is also a keen horse racer himself. The early morning race in Notsavim, Gaza Strip. 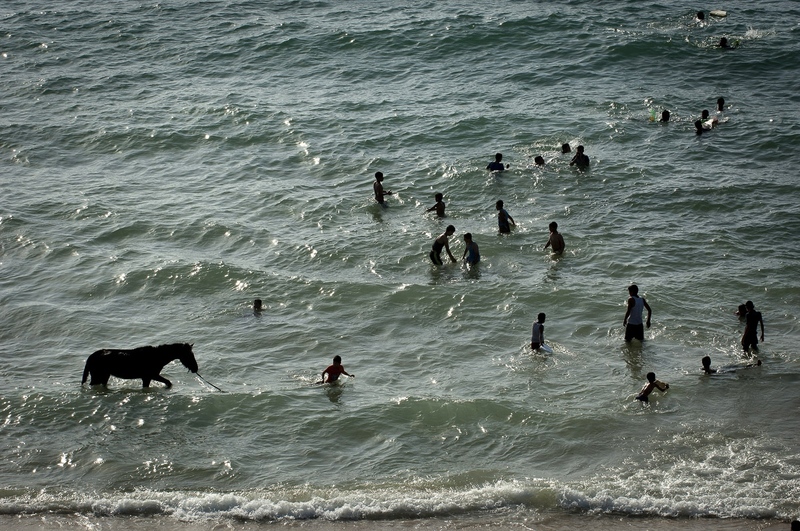 The beach is the recreational centre of Gaza. This includes the horses of Gaza as well. 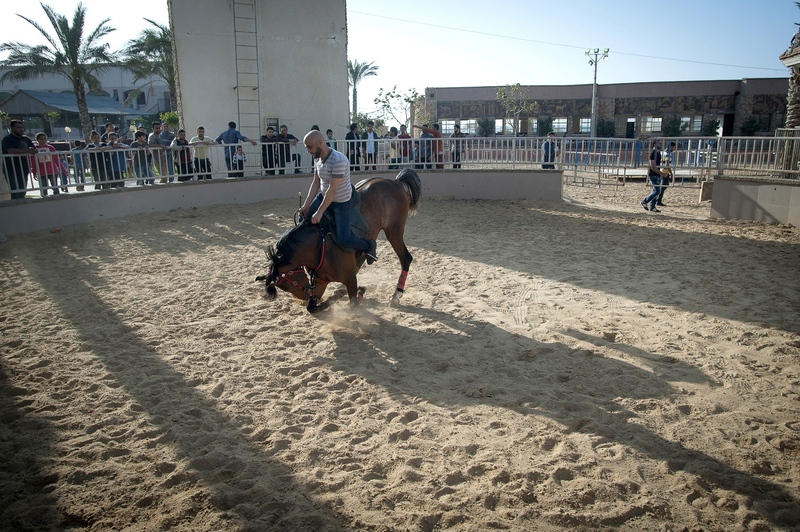 Shaheen Sobhyheen a 28 year old contractor in Gaza City shows off his horse skills with the Arabian horse 'Maharan'. The Arabian Horse is one of the worlds oldest breeds dating back 4,500 years at The President's Equestrian Club in the Gaza Strip. The President's Equestrian Club in the north of Gaza. 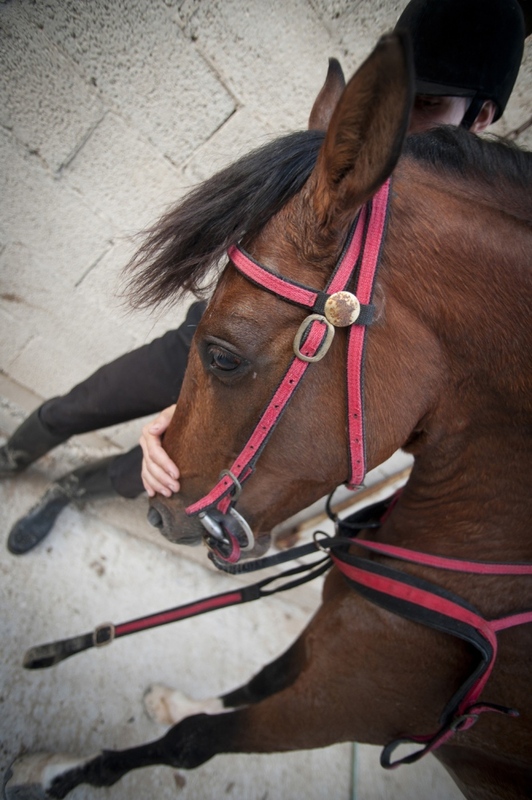 It is the most developed of the 3 equestrian clubs in the Gaza Strip. The Club's is "The place to be seen for Gaza's teenage elite." Catering to a wealthy, young, secular crowd. 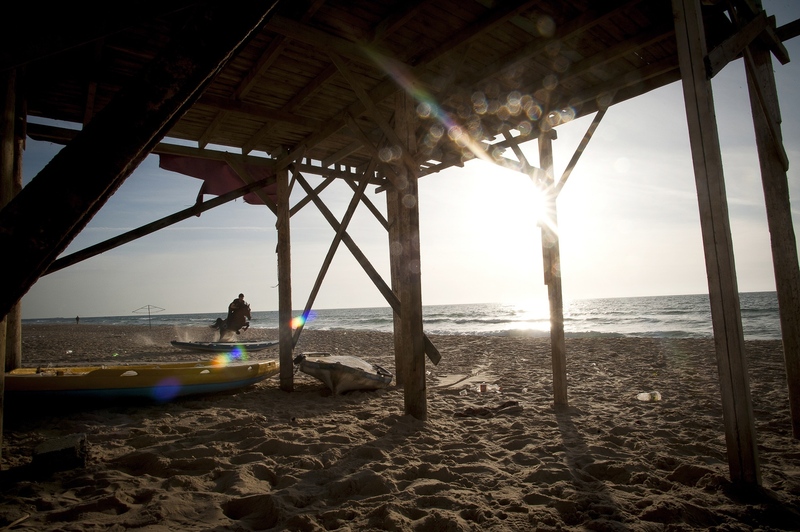 It is part of a recreational "circuit" for wealthy Gazans that includes seaside cafes. 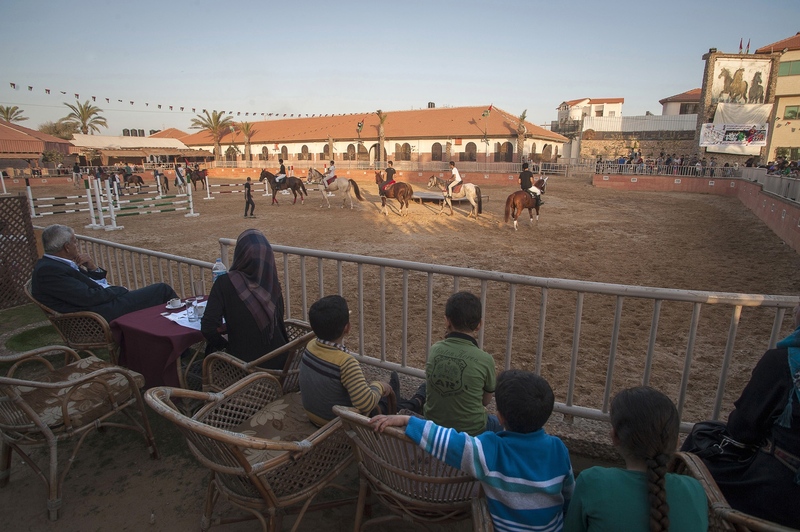 The President's Equestrian Club in the north of Gaza. 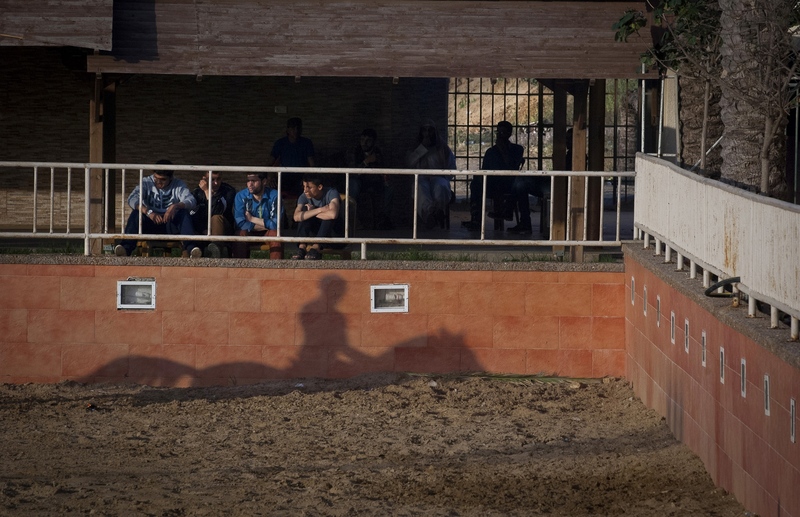 It is the most developed of the 3 equestrian clubs in the Gaza Strip. The President's Equestrian Club in the north of Gaza. The Club's restaurant is "The place to be seen for Gaza's teenage elite." Catering to a wealthy, young, secular crowd. 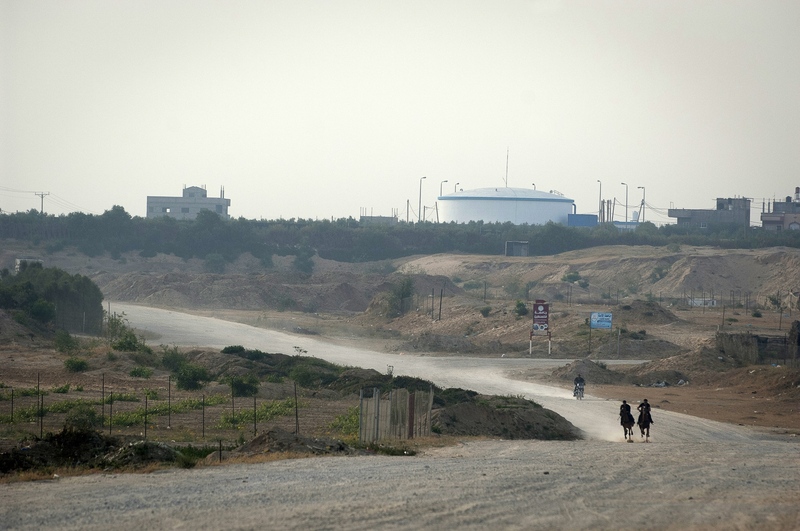 Situated adjacent to the Crazy Water Park it is part of the limited recreational "circuit" for wealthy Gazans. 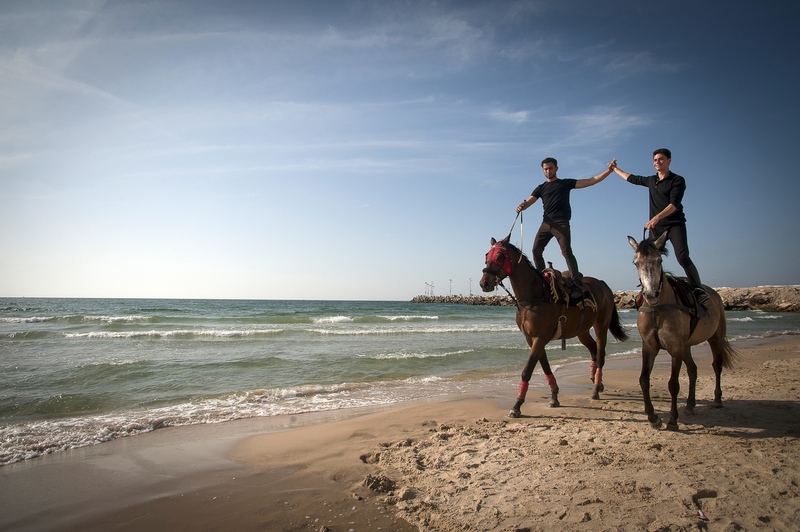 Thundering along the beachfront running adjacent to ‘Shaikh Egleen Street’ in the Gaza Strip is 28-year-old Abdulla al Ghefray riding an 8-year-old Thoroughbred horse originally from Ireland called Ametal. Onlookers open mouthed and astonished witness Abdulla rising out from his saddle seeming to be attempting to dismount at speed. 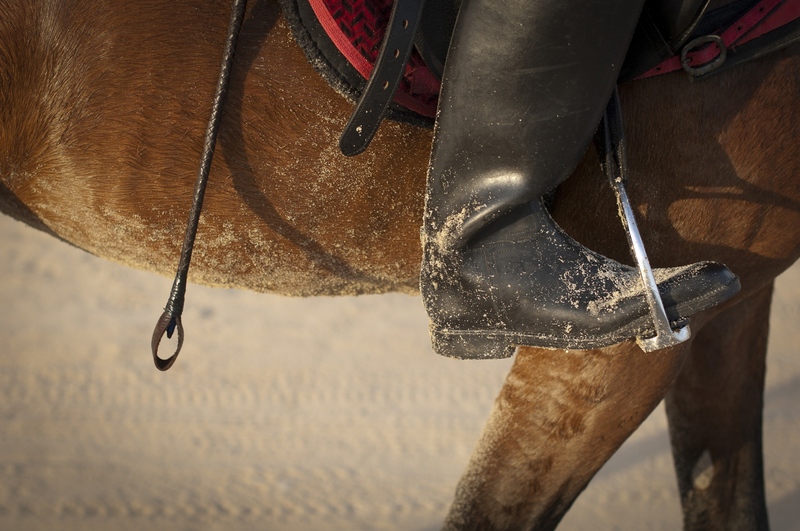 Instead he pivots extends his legs outwards and rests the centre of his back into the saddle while still controlling his horse at full gallop. He rides on content to continue his journey with his body now rigidly horizontal and facing skywards. 21-year-old veterinarian student Siraj Shawa is following him closely behind while sitting in his saddle facing backwards, a new skill he has just acquired. 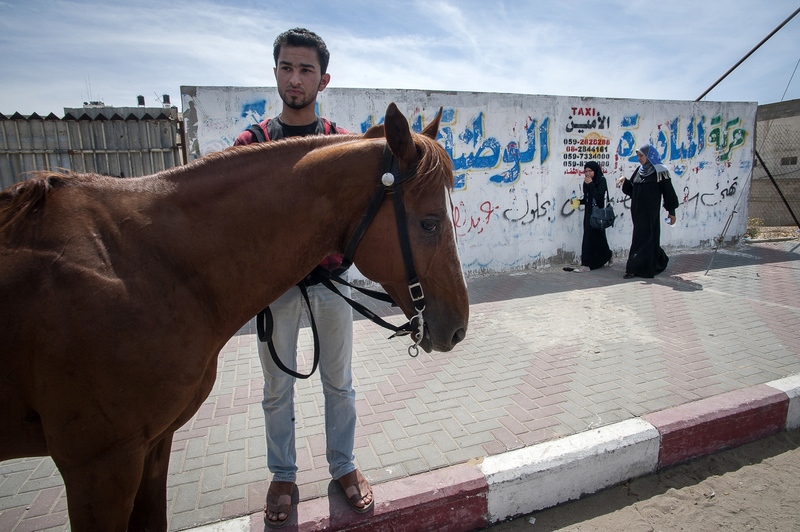 Abdulla and Siraj are part of the tight knit community that is keeping an equestrian life and the tradition of Arab horsemanship alive and well within the besieged enclave of the Gaza Strip. They are both following in the footsteps of the disciplines of ‘al furusiyya’, horsemanship, an honourable discipline that embraces honour, discipline and loyalty and can be traced back to the eighth century in the court of Abbasid in Bagdad. This tradition was taken forward and enhanced within a military code by the Mamluks a military caste that rose to prominence in medieval Egypt (13thc-16thc). They can be equated to the British historical experience and legends of The Knights of the Round Table and their code of chivalry. To become a Mamluk ‘Knight’ religion, logistics, engineering as well as military tactics had to be studied. Only on completion of all these subjects could a horseman be considered a true Mamluk warrior and ride with honour on the fabled Arabian horse. 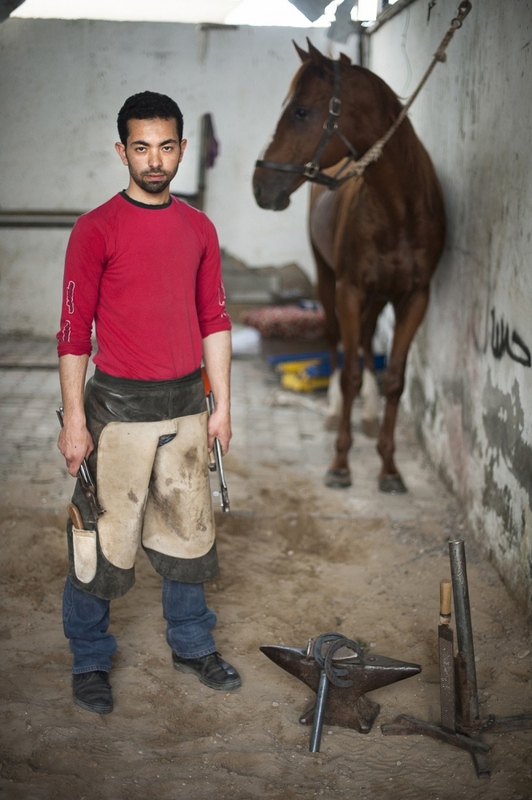 Back in Gaza on Al Jalaa Street near the Al Yarmonk Mosque is 27-year-old Abood al Ghefary, the Strip’s only Farrier, he is busy re-shoeing one of the 40 or so horses he works on each month. 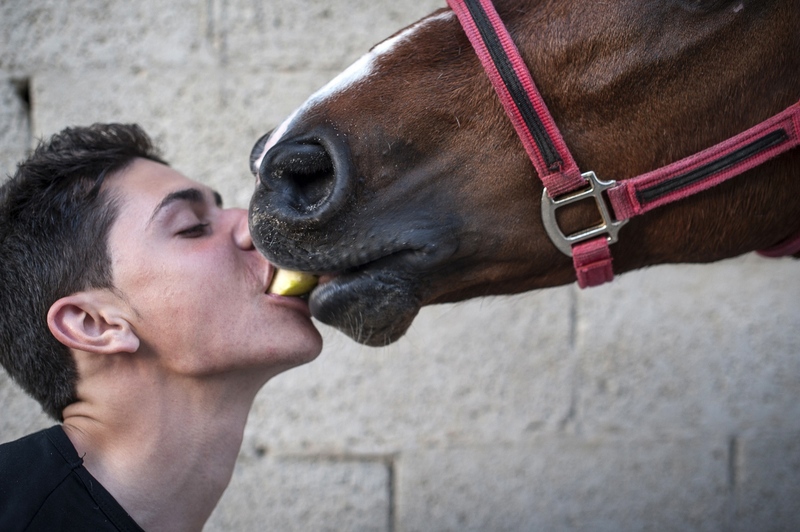 He’s preparing his horse ‘Em al Maark’, meaning mother of war, for a race which will take place the following day in Notsarim in the Gaza Strip. “We don’t have a safe area anywhere for horses to race, but we do have a school for jumping.” Abood explains in-between his work. 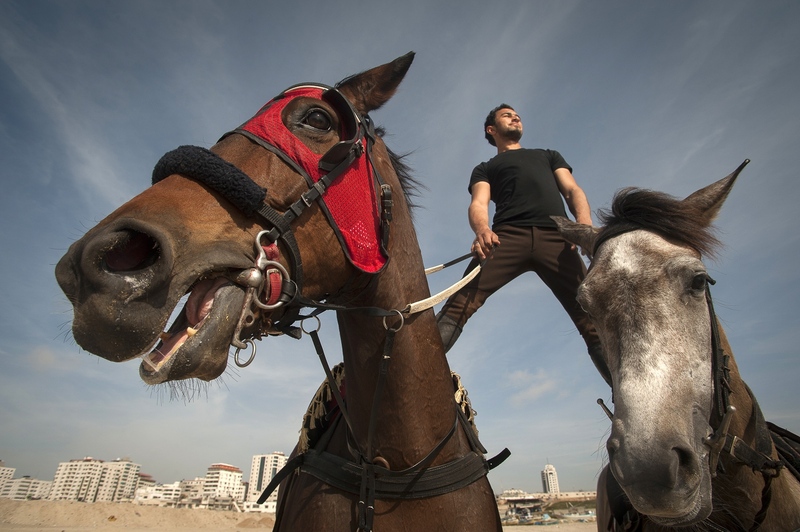 He’ll be riding against his brother Abdulla in a friendly race to determine which horse is the fastest, betting is strictly forbidden within Gaza. “There’s no material gain. We race for prestige and sport.” Adds Abood. 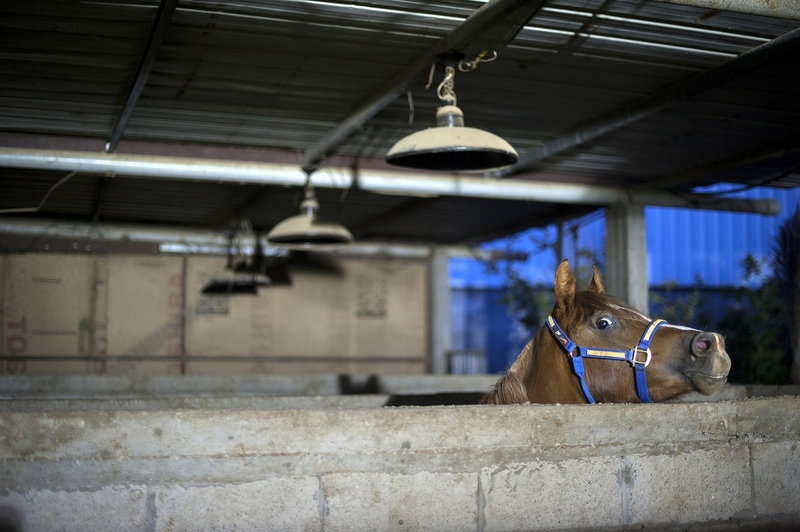 The story of how these remarkable Arabian and Thoroughbred horses have arrived in Gaza is a mixed one. Some were bred locally but many were brought in through the tunnels from Egypt to add to the native stock. 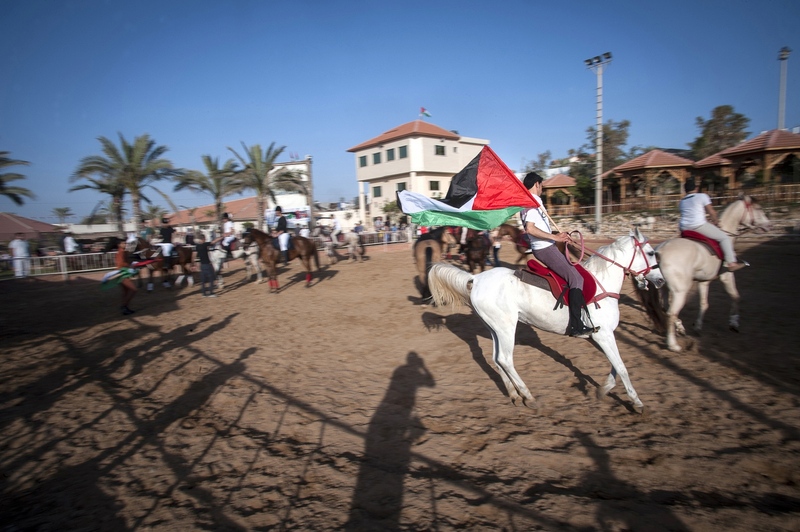 The blockade of Gaza imposed since 2007 by Israel and tightened since the emergence of Hamas as the government of the Strip has clearly had negative impacts on Equestrian activities. However, the commitment that is shown by Gazans involved with their elite horses is clearly a labour of love. The financial costs associated of owning and caring for these pedigree breeds also undoubtedly places those involved amongst the top income bracket within Gaza.